"A Hard Day's Night" is a song by the English rock band the Beatles. Written by John Lennon, and credited to Lennon–McCartney, it was released on the movie soundtrack of the same name in 1964. It was later released as a single, with "Things We Said Today" as its B-side. 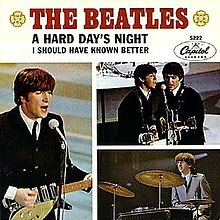 The song featured prominently on the soundtrack to the Beatles' first feature film, A Hard Day's Night, and was on their album of the same name. The song topped the charts in both the United Kingdom and United States when it was released as a single. Featuring a prominent and unique opening chord, the song's success demonstrated that the Beatles were not a one-hit wonder in the US. The American and British singles of "A Hard Day's Night" as well as both the American and British albums of the same title all held the top position in their respective charts for a couple of weeks in August 1964, the first time any artist had accomplished this feat. Hats off to Ringo to give such a title.